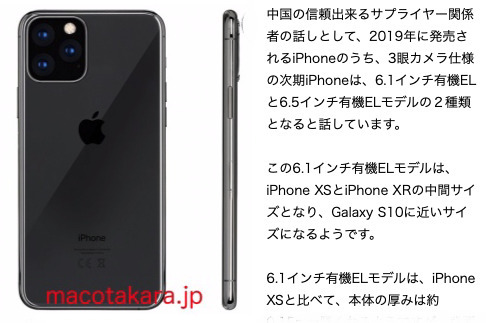 According to the Japanese blog Mac Otakara, Apple's 2019 iPhone range will have two new triple-camera models. These are to be USB-C iPhones with OLED screens and a thicker chassis. This is claimed to be needed to support the previously-rumored triple-camera system in 6.1-inch and 6.5-inch iPhones. The report, citing unnamed supply chain sources, also says that these iPhones will ship with a Lightning to USB-C cable. "The 6.1-inch OLED model might be thicker than the iPhone XS by about 0.15 mm," says the Mac Otakara site, "but the projection of the rear camera is reduced by about 0.5 mm, so the total thickness is increased by about 0.1 mm." There are reported to be similar differences in the dimensions of the larger-screen version. "The 6.5-inch OLED model of the other three-lens camera specification seems to be about 0.4 mm thicker than the iPhone XS Max," continues Mac Otakara, "but the projection of the rear camera is reduced by about 0.25 mm, so it seems that the thickness is only increased by 0.2 mm." There has been no independent verification of this specific rumor. As well as the now regularly reported triple-camera system, there have been rumors both that Apple is dramatically increasing the battery life of the iPhone. More, it's been claimed that Apple is having difficulty with the size of the battery and may be changing its shape. A larger chassis would support the bigger sensor required for a triple-camera system but it would presumably also give Apple more room for a larger battery. Mac Otakara has a mixed fairly consistent track record for reporting Apple hardware releases, but did incorrectly predict an iPhone SE 2 for 2018. Its sources for dimensions of the 2018 iPad Pro models were closer and the site did accurately report on Apple offering repairs for flood-damaged devices in Japan.